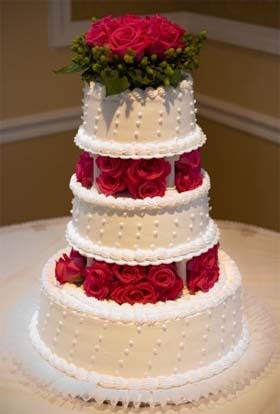 Celebrating your marriage during the magical holiday Christmas Season lends itself to an elegant Christmas theme cake. The Christmas Season is filled with a wonderfully rich color palate including; reds, greens, silver and gold. A very creative idea would be to have your cake designed with a smooth white frosting using holly leaves and red berries or raspberries accenting each layer which can then be set atop a sleigh drawn by Santa and his Reindeer. Another thought - have your beautiful creation placed on top of snow glitter surrounded by a snow covered town or a miniature train circling your baker's delight. Placing the cake on top of a silver or gold scalloped doily will give an air of elegance and sophistication to your celebration. You may want to consider decorating the cake table with a Christmas tablecloth or other tablecloth that will highlight your scrumptious delight. Christmas cake designs are limitless. Another unique concept for a Christmas pastry delight is to have a tiered cake with each tier placed upon pillars. In between each tier you can have an edible red bow, or red poinsettia blossoms. Green poinsettia leaves can be made with frosting as a subtle accent. Having each tier of your creation look as if it were an individually wrapped package is a creative idea that works perfectly for a Christmas theme. You can also use marzipan or almond paste to decorate your cake giving it both texture and a fabulous taste. If you cannot find a bride and groom topper that fits with your holiday season theme go to a ceramic store, purchase a bride and groom and paint the topper yourself or have some talented friend help you out. You can put green or red bows in the bride’s hair and paint a red or green bow tie on the groom. The above fabulous 3 tiered cake has red fondant ribbons and bows wrapping each tier to simulate a package. 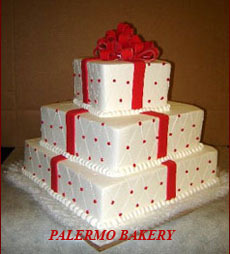 Check out their site at Palermo Bakery and go to their Wedding Cake Gallery. I promise - You will be delighted! Since the bridal cake is the primary focal point of your reception hall, be creative and use my Christmas wedding cake ideas to give you tips on how to make your celebration memorable. www. 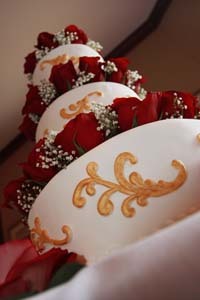 Pieceocakenj.com created these elegant but not overstated Christmas Wedding Cakes. Want more ideas for a fabulous wedding?